One final post for our 2017 Embrace the Mystery Music Mission. 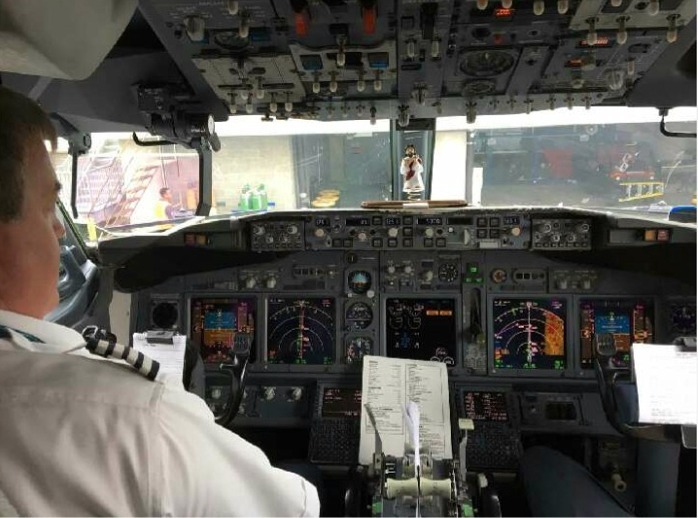 Somehow or another, Maya managed to get the pilots to agree to let us take a photo of the cockpit WITH DASHBOARD JESUS ON THE DASH! I've always loved Southwest Airlines. Now I love them even more. While he didn't get to stay there for the flight, I feel like letting him sit there for a moment is wholly responsible for our 15 minute early arrival into Hartsfield. Prove me wrong. This morning we gathered at 10am to warm up for the worship service. Our folders were in Flagstaff, AZ, so we had to sing without them. This wasn't a problem--we sang our last concert without them and did fine. I have to give a shout out to the worship team at church here. They removed a bunch of pews a few months ago, and this made it possible for us to do the program from down front. That put us a lot closer to the congregation. The removal of pews also allowed us to get Neil a lot closer to the choir so we could hang together better. This is functional and boring stuff, but the result is a very different and much improved experience. The worship service was joyous from beginning to end. We sang all our songs at one time or another. We also included three congregational songs accompanied by PB&J (Patrick, Bill, and John). I preached a short sermon, but I'll tell you what: no preacher could preach better than our youth choir did this morning. It was remarkably good singing, especially after a week on the road. The congregation responded well. We had several youth participate in the worship service, and they did a fantastic job. Garrison read the scripture, Layton read the prayer of Thanksgiving, and Anna prayer the pastoral prayer, which she had also written. Her prayer was remarkably deep and connected to what we had set out to accomplish with our worship service today. Taken as a whole, this mission was everything I hoped it would be and more. As is usually the case, there were bumps in the road (literally, actually, as some of those bumps are what disabled the bus video system). We overcame those obstacles as a team. We laughed together. And yes, we cried together too. We grew together. It was, as ever, and honor and a privilege to travel with such fine folks...and we have already begun conversations about where we will go next. I don't know for certain how this journey affected other people, but I know how it affected me. I have been fearing the future because of the challenges the church is facing and the challenges the Church is facing. Over the week, though, I came to believe that the future is a mystery to be embraced. All week long I have watched the youth and the chaperones embrace the mystery of an uncertain future, and they have inspired me to embrace my own uncertain future. All this is odd, because I have been planning this mystery mission for a year. I didn't know how resonant it would be for me. Leading me to think that maybe, just maybe, it wasn't my plan at all. Katherine Hudspeth, Amanda James, Catherine Proctor, Cindy Petersen, Beth Williams, Tait Anberg, Curt Halstead, Vince James, Chris Opstad, Paul Petersen, Courtney Lonsway, Lea Parker, Rosie Ronca, Sebrina Shelton, and Matthew Waller. The chaperones and alumni knew they were signing up to drive to Los Angeles on a bus with 40 youth, and they came anyway. They created breakfast out of thin air. They tended to our ailing singers. They kept everyone safe. They untaped the doors every morning to give me 30 more minutes of sleep. They never complained. Most importantly, they love our youth. They are the heart and soul. Jessica Vazquez and Anna Price. There was a lot of administrative work behind the scenes to secure hotels and venues as well as work some of the logistics. These two saved me! (Bonus: the fact that Jessica's husband is also named John made for a really funny story when a hotel called her to verify something, and she thought for a brief moment that her husband was taking her to Sedona. She tells this story better than I do.). Neil Thompson. We all love Neil. He helped us learn the music, and he accompanied very well for us. It definitely wouldn't be the same without him. But there's more to it. Like the chaperones, he takes an interest in the youth. We were indeed fortunate to snag Neil back in November. Michele Wright. She just had knee surgery on 5/4, and she was on the bus for a week beginning 6/4. She brought a little ice chest so she could ice her knee when needed (which she sacrificed for the cause because she left it behind in LA). Michele is talented and caring and thoughtful. She kept me focused on the right things throughout the week. Virginia Hudspeth. Virginia is a youth who helped me plan all the fun things and food stops. She spent a lot of time with Google and Google Maps looking for restaurants and looking for little things along the way. Just about every fun activity we did was by her suggestion. I never would have been able to find so much for us to do along the way. Luckily she isn't graduating yet! Mark Story. Our bus driver. He is one of us. He cares about our youth just like the chaperones, and he is a delight to work with. Parents and families. We couldn't go on trips without parental support. Financial support, yes, but more importantly the willingness to entrust me with their children for the week for this mission. Mentor/Sponsors. The mentor/sponsor program was a huge success this year because people committed to the program and followed through. The youth loved getting to know them, and it made a huge difference when I handed out the letters later in the week. Supporters. There were about 135 people who I know supported our music mission financially. Those are just the ones I have the names for. The actual number is probably twice that. They came to waffleoffs. They bought ham gift cards. They gave at concerts. This subsidy makes it possible for every youth who wants to go be able to go. Pray-ers. We feel the support of everyone who lifts a prayer on our behalf. Prayer works. Blog Readers. You take an interest in our mission. Knowing you are going with us makes it all the more fun! Thank you to all. And in case I don't see you, good afternoon, good evening, and goodnight. Loved taking this awesome journey with you! The youth had an amazing leader too! Godspeed!